Customized hunter & white 43” manual open mini fold umbrellas are gaining popularity in this season amongst marketers because people find them extremely appealing. This mini fold umbrella features – steel windproof frame, hunter and white nylon canopy and rubberized handle. Promotional hunter & white 43” manual open mini fold umbrellas are usually sought by marketers in technology, lifestyle, luxury, construction and green related businesses. 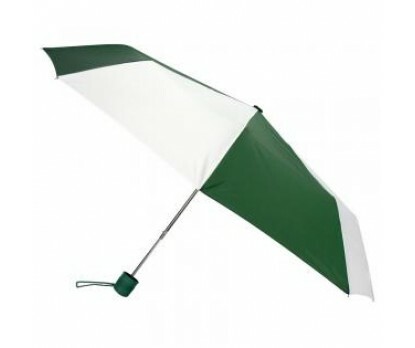 This umbrella offers them best value for investment - by serving them longer, and by keeping their customers fascinated. Custom hunter & white 43” manual open mini fold umbrellas can be distributed during some mass programs or they can be handed out as sales driving gift during festive events. Dimensions - 43" arc - Closes to 10". Imprint area - 7"W x 6"H.